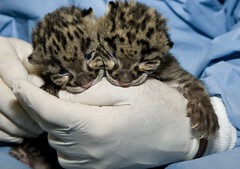 The clouded leopard cubs are both boys, it turns out, as the National Zoo showed them off after their vet visits this morning. They’re over a pound each now, and have opened their holy-crap-that’s-cute little blue eyes. Not that the National Zoo would let me, but I would totally take these guys home with me.